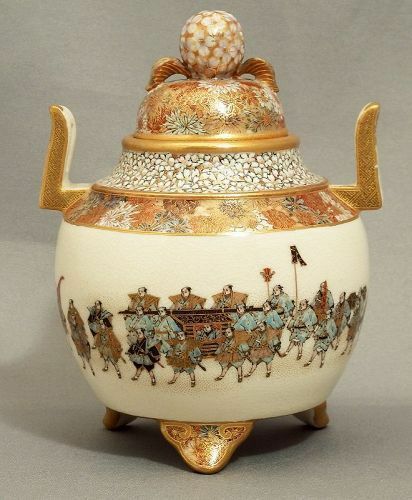 This urn is a rare form by Yabu and is finely decorated with a continuous daimyo procession that follows entirely around the body. The enameled floral designs and finial sculpting are executed in excellent detail. One of the handles has been restored and can be seen upon close inspection of the images. However, it is not noticeable without a good amount of scrutiny and does not impact the body of the piece at all. We have priced this item accordingly. The dimensions are 4 1/3 x 4" and it bears the gilt seal of Yabu Meizan on the underside. Circa 1900 - 1910.